QQ music is an online music provider in China. Users can listen music online and download music from its official websites. It can compatible with Windows, iOS, Android, and OS X operating system. It is convenient for people listen music freely. 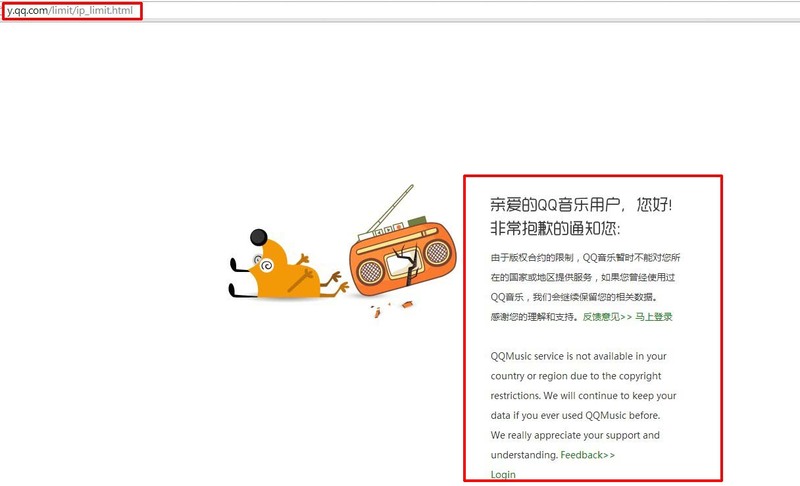 I found that QQ music web isn’t available for people who are living outside of China for copyright recently. So I want to introduce ways to listen QQ music online and download free music from QQ musics. I will list two ways to unblock QQ music outside of China. 1: Visit http://y.qq.com, then you will be redirected to http://y.qq.com/limit/ip_limit.html web as photo. 2: Click “马上登录” – Tap QQ music logo. Then you can listen online music now. Please reference the photo below if you don’t know how to operate. 1: Download QQ music version for PC, iPhone, iPad, Mac, Android Phone and Android Pad here: http://y.qq.com/#type=down&p=detail . 2: For instance download QQ music PC version. Install and run it. If you have QQ account, you can login with it. 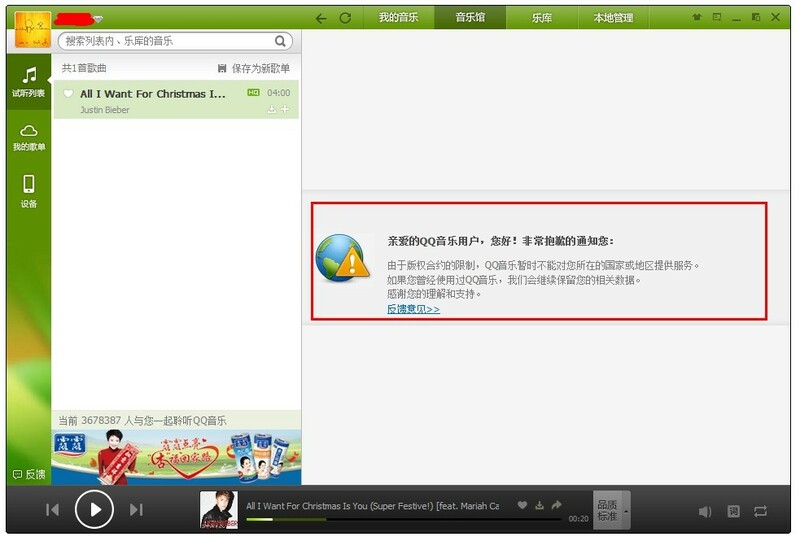 3: Click “音乐馆”, then an message pop up and doesn’t allow you to access its music list for copyright as photo. 4: Connected to China VPN server and get Chinese IP address to bypass the IP filtration. Whatever you are using QQ music PC, Mac, iPhone, iPad, Android phone, or Android pad devices, you can connected to China VPN and bypass the IP restriction. If you haven’t find VPN service provider which provides China VPN service. You can try to use FlyVPN. You can use FlyVPN on PC, Mac OS X, iPhone, iPad and Android smartphone. You can read VPN tutorials here: http://www.flyvpn.com/tutorial. 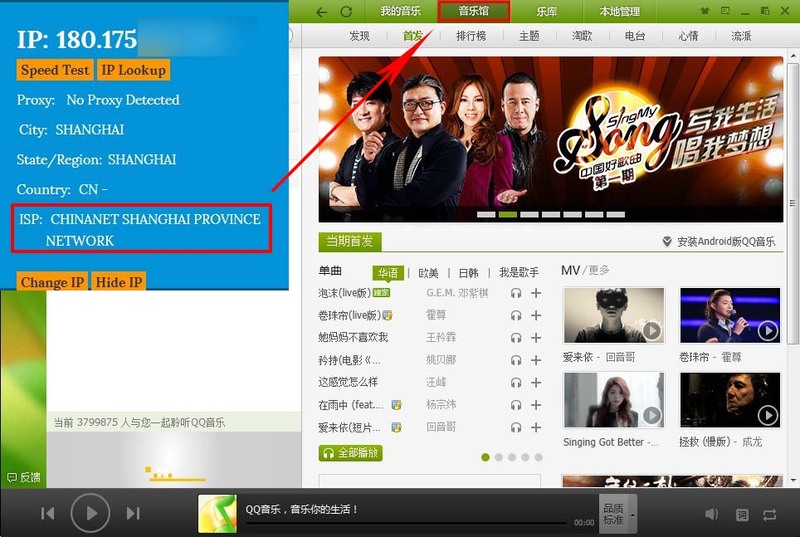 Listen and download online music on QQ music outside of China with VPN. Unblock IP restriction in China. Listen music around the world and download free music without limitation.